The RERA Authorities which is established under the Real Estate (Regulation and Development) Act, 2016 have been addressing the grievances of the aggrieved home-buyers. Since its roots into existence; all the frauds, cheating and false promises are well being punished. However, as the principle of the natural justice even the Builder has a right to go before the appellate tribunal. 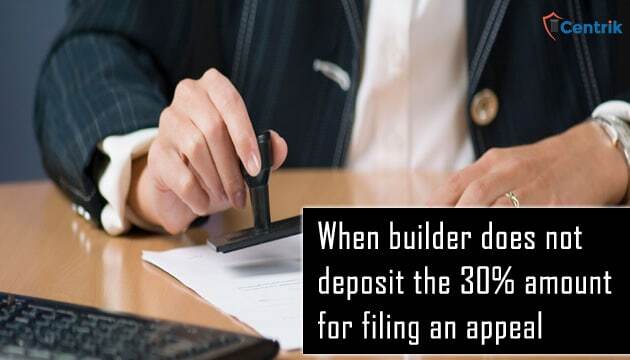 As per the provisions of the RERA Act, 2016 if the Builder wants to file an appeal then he has to deposit the 30% of the penalty or such higher percentage as may be determined by the Appellate Authority or the total amount to be paid to the allottee. Recently, in the matter of Vidhi Developers, the said builder moved an appeal against the order of MAHARERA Authority, the developer was directed by the RERA Authority to return the money of the few-flat buyers. However, the order was challenged but the builder was unable to deposit the amount required as per the section 43(5) of the RERA Act. Consequently, the judicial member of the appellate tribunal rejected the appeal of the builder by stating that as the requisite amount was not deposited then such appeal cannot be heard and entertained. He also added that the promoter was given a reasonable time to comply with the order and also the builder did not seek for any extension of time for depositing the amount so it appears that they are not interested in pursuing the appeal. Further, he also said that the Builder is just trying to prolong the cases as he nearly got eight months’ time by filing this appeal. In the light of above-mentioned instances, we can clearly infer that no builder can escape with the provisions of the RERA Act; even if they want to appeal they have to comply with the each and every provisions as given otherwise they will have to face the strict decision of the Authorities.